What is the Fine Canine - A Collection of Tails? Join us in celebrating your dog, your best friend, your kids loyal protector, your first baby, your only baby. The bond between a dog and his human is like no other. 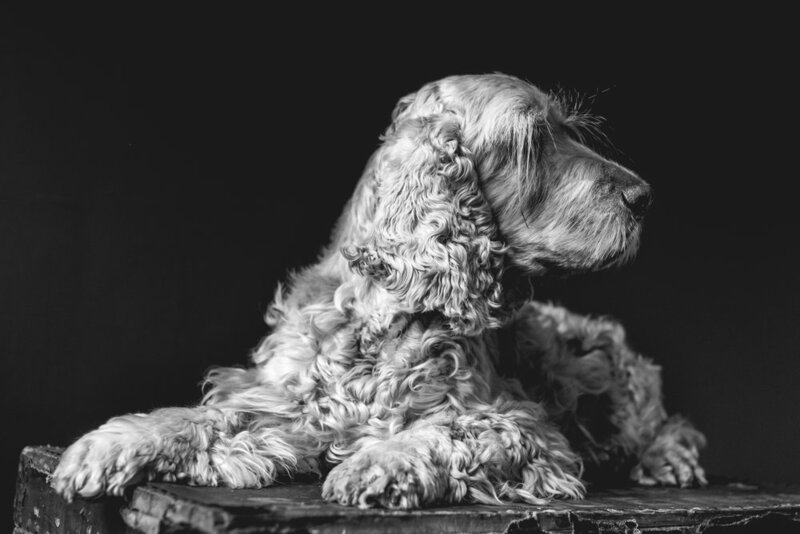 Commemorate your favourite fur ball with a beautiful timeless black and white portrait. We are looking for a diverse range of dogs to create a beautiful coffee table book with little anecdotal notes and stunning portraits. To participate please apply, there are two options to consider. You will be guaranteed a full page place in our coffee table book featuring your Fine Canine with little anecdotal notes about them. You will also have the opportunity to purchase additional portraits from your photography session if you wish. The book will be available if you decide to purchase after for approximately $100-$150, as it will depend how many we order. They assist more than 47,776 animals in need every year and are funded by compassionate animal lovers who support and partner with us to protect and enhance the quality of life for domestic, farm and wild animals in BC. Your portrait photographer is Tamara, who has been photographing families and their pets for over a decade. 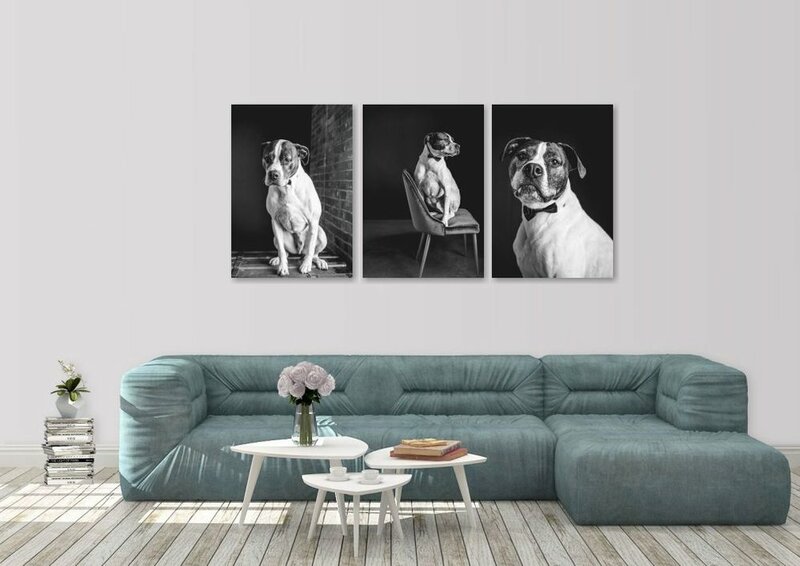 We recently relocated our studio to a dog friendly building, just so we could offer these beautiful portraits of your most beloved puppy dog. When can we have the portraits created? During normal studio operating hours: Tues - Thurs, 9:30-5:00 for Victoria and Fridays 10 - 5 for our Vancouver Studio. The first step is to apply and we will be selecting a diverse range of dogs to showcase and feature in our beautiful coffee table book. We will then give you a call and send you more information to prepare you for the session and answer all your questions. Can I have all the family photographed? Absolutely! We will be happy to photograph the whole family at no extra cost, we recommend you take full advantage of the photography session. Can I purchase photographs? Yes, of course we will give you the opportunity to purchase the portraits we create. When we chat prior to the session and we will talk about what you might like to do with the photographs we create for you. Maybe you would love to display one in your home, or a wall collection, or a fine art album of the entire collection. We have many beautiful options to choose from. Matted fine art prints begin at 200, finished wall art starts at 700 and collections range from 1800 and up. See our gorgeous finished products here. Portraits are only kept on file for 28 days, any ordered portraits are keep indefinitely. How long do you keep the portraits for? Photographs are kept for 28 days from your session date. Will my photograph be in the book? Yes all those who are accepted and pay their participation fee, are photographed, and return for their slideshow presentation/ordering appointment will be in the book. Do I get to choose the photograph for the book? Our designer will get the final say in which portrait goes into the book, but they will choose from your list of favourites which you will create at your ordering appointment. This just ensures that the design of the book is as diverse as can be. When will the book be published? We expect that this project will take at least nine months to plan, shoot, edit, collate and publish. You will be kept in the loop as we move along in the process. How much will the book cost? The price of the book will depend on how many we will order, but will be around $100 - 150.